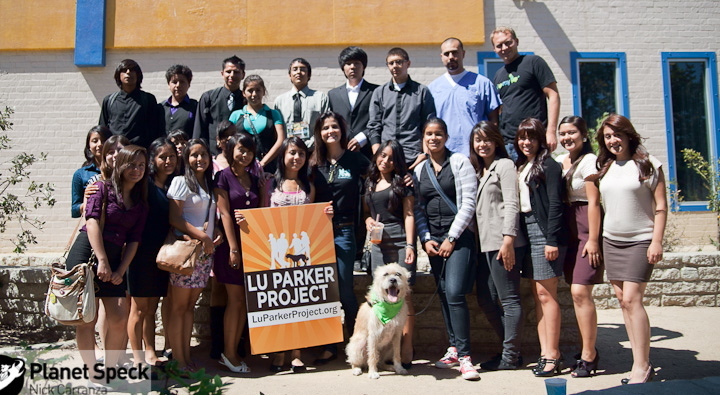 Lu Parker Project started Project Picture at South LA Animal Shelter in October of 2011. Saro sets up for our first picture!!! We are always in need of Corporate Sponsorship and donations. You can donate directly at Thank you! A Special Thanks to our Volunteer Photographers: Casey Chang, Saro Karagueuzian, John Cole and Jeff Molyneaux!!! Once there, type Lu Parker Project in the search box at the top right of the page. If you prefer to simply donate to our cause, that’s easy too. Once there, type Lu Parker in the search box at the top right of the page. Once on Lu’s page, click SUPPORT ME and give what you can. Your donation is 100% tax deductible!. Patrick and Ana here as very very sick babies. Ana & Patrick are parvo free and have a new forever home together! 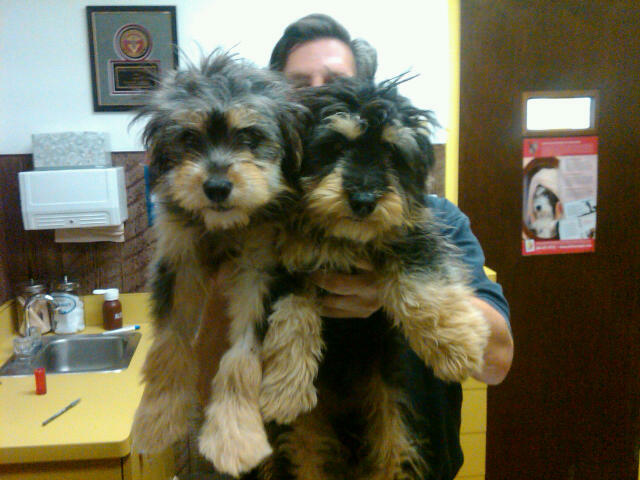 Our latest rescue involves two 4 month old puppies that we pulled from South LA Animal shelter. 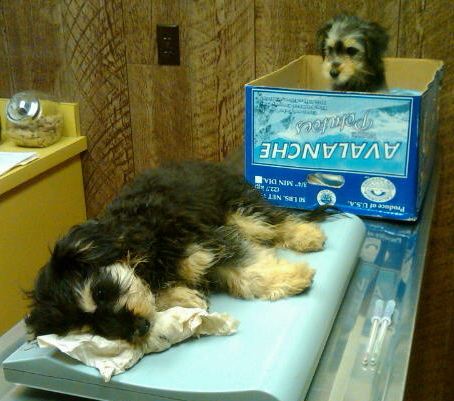 The two puppies came in with parvo because their owners didn’t know to vaccinate them. Parvo is deadly and highly contagious. LPP paid for Patrick and Ana to receive medical attention, and with the help of Brent Air Animal Hospital we were able to save these two beautiful dogs that would have otherwise been euthanized on the spot. 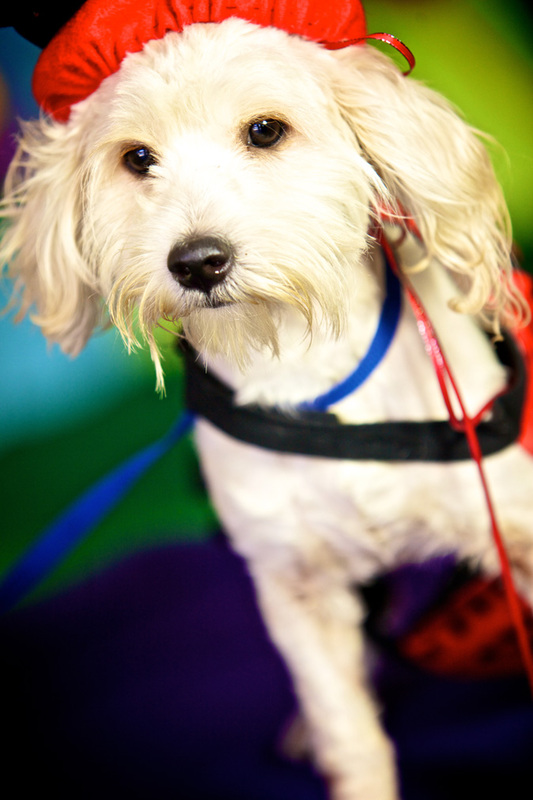 In our effort to reach the youth of Los Angeles, Monkey and I, along with Gabe and David of Animal Wellness Centers visited Bresee Youth Center this month. The teens got a chance to discuss animal welfare issues, and we brainstormed on how they could help reach out to their own community. This is just the beginning of a strong relationship. 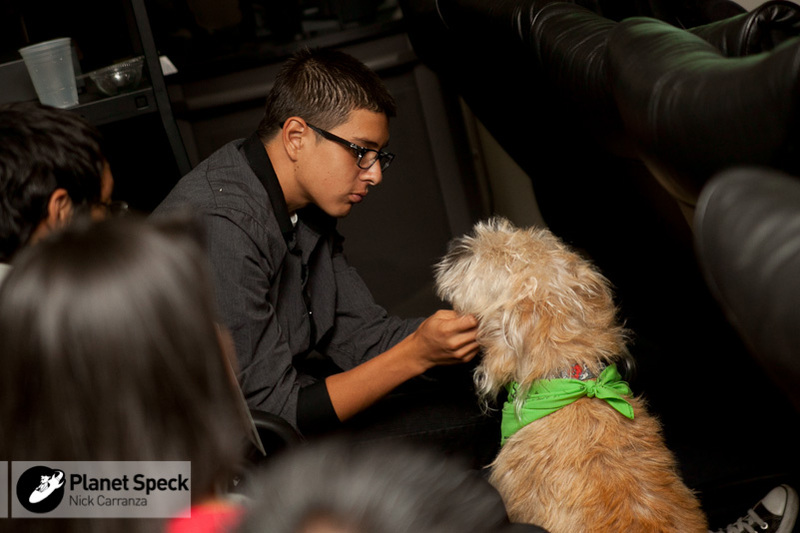 We dream of reaching more at-risk teens to help educate them about being kind to all animals. That is why your donations are so important. We brainstormed on how to help the community. We believe rescuing is important, but we also believe education is key to ending overpopulation. We hope you can help us spread the word…. If you walk with us, feel free to bring your dog or plan to walk a homeless dog! Hope to see you soon!!!! Many years ago before I was a journalist, I was a high school teacher. At the young age of 24, I was teaching 18 year old Seniors in the public school system in South Carolina. It sounds so ridiculous now, but back then I didn’t think twice about it. I was fresh out of Graduate school, and ready for my first classroom experience. Honestly, I don’t think about it much these days, but I was reminded this week when I saw the new film Waiting for Superman. The film is written and directed by Davis Guggenheim, the same man who brought us An Inconvenient Truth. The title sort of throws you off until you see the film, which highlights the plight of the public school system here in the United States. An educator, featured in the film, who grew up in a poor neighborhood, says he was always secretly waiting on Superman to swoop in and save his family and community. Looking back on my students, I bet many of them dreamed of the same Superman idea. A majority of them came from broken homes, and communities where education was not a priority, so why should they pay attention and stay in school? It’s the age old debate. How do we keep our kids in school and keep them motivated when it’s hard enough to get them to class?. Once there, as the film points out, they’ve got a 50-50 chance that their teacher will actually be a decent teacher. According to Guggenheim, the system is so broken, bad teachers are allowed to stay, even if it’s been proven they are performing poorly in the classroom. Everybody knows who they are, but there’s nothing administrators can do. The film points to union contracts and tenure, saying they often give teachers a solid spot in the classroom. Good or bad. Looking back, as a teacher I likely scored points for enthusiasm and creativity. I didn’t have years under my belt to know how to deal with lets say, discipline issues, but I know I had passion. I wanted to inspire. Eager beyond words, I was early to work every day. I found that many of my students who were from low income, and single family homes, would come to school early too. Eventually I realized these kids were showing up early, not because they wanted to be at school, but simply because they needed a friend, a confidant, a teacher, anyone.. They just needed someone to listen. I didn’t teach long, less than 3 years, but I have never forgotten the lessons I learned from the profession. My students taught me that sometimes you don’t have to be perfect, you just have to try. You don’t have to know all the answers, you just have to be willing to talk it out. And most importantly, they taught me to listen even when I didn’t want to. Waiting for Superman, which opens in theaters in Los Angeles and New York today, reminded me that no matter what profession we have chosen for life, there is always at least one student out there waiting for us to reach out and hold his/her hand. If each of us helps at least one child, we are one step closer to healing the system. It’s the distance I used to drive as a teenager from my house (in the country) to the small SC town of Estill. It’s almost like walking from Santa Monica to Hollywood. That’s what I’ve pledged to walk. 13.1 miles. Please JOIN me!!! If you can’t join, can you please help support me?? Why you ask? Check out the following letter and info to find out. There’s a lot of cool stuff. THANKS. I am excited and scared! I have committed to do something that isn’t easy, but will be very rewarding. Along with other volunteers,I will be walking 13.1 miles next month in the LA Rock-n-Roll Half Marathon to raise much needed funds for a non-profit I started this year called Lu Parker Project. 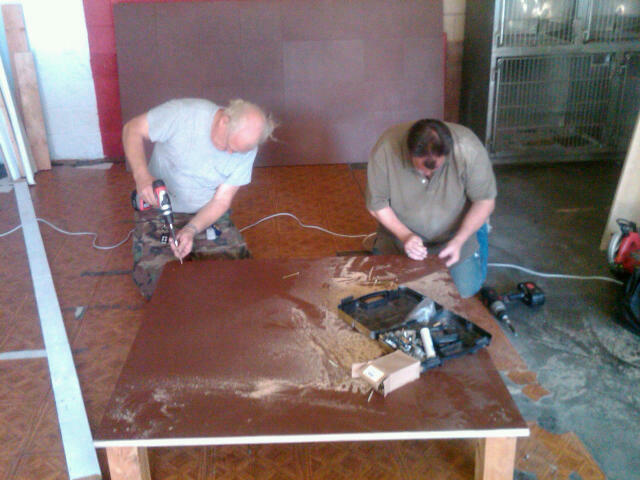 Our projects are already helping homeless animals and at-risk teenagers in Los Angeles. 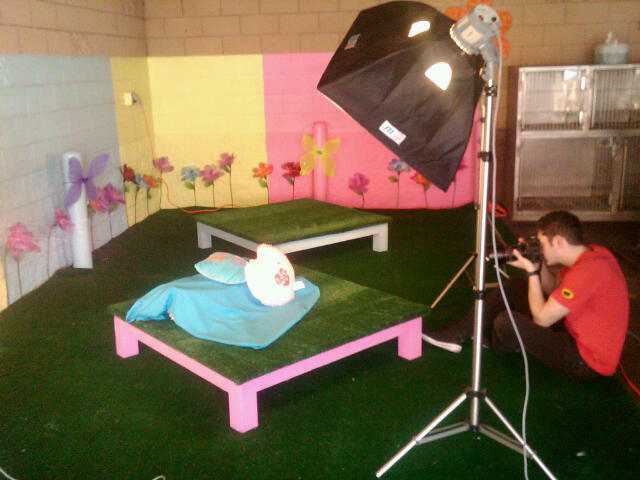 *Along with local teenagers, we re-designed the entire lobby at South LA Shelter. *We bathed and groomed nearly 20 shelter dogs so they would be more presentable for adoption. *We have helped place over a half a dozen homeless dogs and cats into new homes. We did all the above with NO funding, but it’s difficult to continue this way. That’s exactly why many of us have committed to walking the upcoming half marathon. For more info on JOINING OUR TEAM, or to sponsor a walker, click below. To SUPPORT ME individually, please click below. It’s easy to say and often times a great excuse for not doing something in life. Whether you are looking to change jobs, go back to school, or even get out of a bad relationship, the words can paralyze you. I admit I have learned the “I can’t” lesson from my own experiences, but was reminded today that none of it was necessary. The person who reminded me was a teenager from Los Angeles named Kenneth Chancey, but this 18 year old is not just any teenager. You see, this kid has experienced more difficult situations that you and I may ever encounter in our lifetime. For most of his school years, Kenneth has been homeless. He tells me he has bounced around from foster home, to homeless shelter, even admitting to once living in a van with his family. With all that baggage, Kenneth never gave in, and today he walked on stage to accept his high school diploma. I was there as a reporter, and have to tell you it was a beautiful sight. Kenneth could have said “I can’t” but instead he said “I will.” Here’s his story. Please help spread the news!!! I ran across this video about a week ago, and haven’t been able to get the images out of my head. It has affected me beyond words. I hope you get a moment to look at it. A warning, it’s difficult to watch. I wanted to turn it off, and did several times, but I made myself watch it so I can remember. Donating a toy at Christmas is nothing new, but this year there’s a twist, at least at one local vet office. My friends at Brent-Air-Animal Hospital are holding a toy drive for the next 14 days. In return they will give your dog a FREE nail trim. If you donate 3 or more toys, they are offering a FREE dog exam. Spread the word!! It’s easy…and in the spirit of Christmas!!! !